The information on this page is intended to help users learn more about Digital Mobile Radio, otherwise known as “DMR”, and to outline the steps to get started using this fast growing digital mode for ham radio communications. While not part of the DMR standard, all DMR Association members have agreed to use the AMBE+2 vocoder with their DMR radio equipment to ensure interoperability. 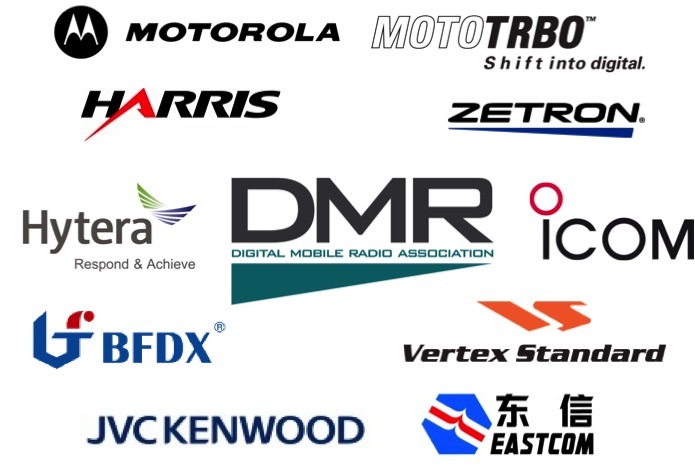 In order to promote the growth of the DMR market, the DMR Association was formed and consists of various stakeholders involved in the DMR ecosystem. In addition to promoting DMR, the DMR Association provides interoperability testing and certification of DMR equipment. There are several manufacturers that build DMR radio equipment, including Motorola, Vertex Standard, Harris and Hytera, to name a few. Longer battery life – up to a 40% improvement as compared to FM radios. 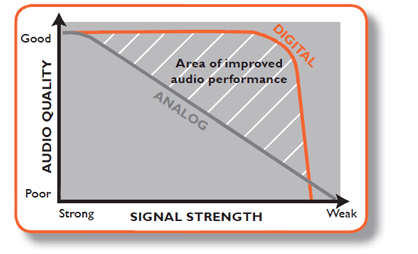 One of the most noticeable difference between DMR and analog FM is the audio clarity. While FM signals get progressively nosier as the signal gets weaker, DMR operation remains crystal clear up until the threshold of coverage is reached, then it quickly becomes unusable, as depicted in the below diagram. To leverage the capabilities of this equipment, the Motorola Amateur Radio Club, in conjunction with other regional partners, have created a global network of Internet connected DMR repeaters, utilizing Motorola’s MOTOTRBO technology, called the DMR-MARC network. This network consists of over 200 DMR repeaters in countries including Canada, USA, Germany, Australia, South Africa, New Zealand, Switzerland, Spain, Austria, Finland, and Sweden. Another advantage of using DMR repeaters is their spectral efficiency, as they can allow two simultaneous conversations at a time using dual TDMA timeslots, which are analogous to “channels”, and do so using only 12.5 kHz channel width. Typical analog FM repeaters can only operate on one channel at a time using a single 25 kHz wide channel. So for the same channel width as a typical analog FM repeater, you can four times the capacity with DMR! DMR equipment is available from a variety of manufacturers that can easily be used for ham radio purposes. The most commonly used and readily available units are from Motorola and Vertex Standard, as there are a large number of commercial users leveraging radios, especially in North America. DMR radios are available in other HTs or mobile units, with the former being the most popular. Since these radios only operate on a single band, the majority of ham radio use of DMR is on the 70cm band and as such, anyone looking to get started in DMR should look for equipment that operates in the 403 – 470 MHz band split. For more information on recommend models, please refer to the FAQ page. Below is a video that demonstrates the usage of DMR during the DMR-MARC World Wide Net. Take a listen! For more information about DMR, check out the FAQ page. Copyright © 2016 VA3XPR. All rights reserved. Unauthorized use and/or duplication of this material without express and written permission from this site’s author and/or owner is strictly prohibited. Excerpts and links may be used, provided that full and clear credit is given to VA3XPR with appropriate and specific direction to the original content. Copyright © 2019 VA3XPR. All rights reserved.